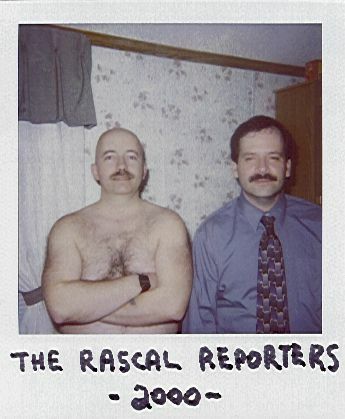 From the ashes of "Raw Meat" (an earlier, "rock/noise" 2-man group, with musicians Steve Gore, and David Johnson; operating during the late 1960's/early '70's), rose the Rascal Reporters in 1974. Steve Gore remained; David Johnson was replaced by Gore's high school buddy, Steve Kretzmer. Both musicians shared similar interests in life and music, both were composers and musicians, and both just happened to play keyboards and drums. A perfect musical union was formed that continues to this day, and beyond. Both Steve's were born in 1958 and raised in suburban Detroit (Oak Park, Ml). Both Steve's are left-handed. During the years 1975 and 1976, the group literally were writing and recording one song per day, everyday, throughout both years. A 12-CD box-set of unreleased music could be culled just from these two years alone. Steve Gore, renowned for never erasing any piece of music from any tape at any time or any year, is largely responsible for the existence of the 30-year "bottomless" tape vault known as the "RRkives." The first attempt to "go public" was in 1978, with a planned 45rpm picture-sleeve release, "My Name"/"Ricky And His Dad." The release was cancelled due to lack of funding, though the two songs will appear on the "Rascalities 1974-1999" 12-CD box set, to be discussed further on. Public exposure finally came in 1980, when Archie Patterson of Eurock then based in California, released the Rascal Reporters' full-length "cassette album," "Freaks Obscure" to the world. This was one of Eurock's very first releases in the relatively new era of "group self-produced albums on cassette." This was immediately followed-up with "We're God," also a Eurock cassette release, and also issued in 1980. These two releases established a small, but strong world-wide cult following for the band. People suddenly wanted to hear more of this strange, bizarre, often obscene ("Freaks Obscure"), though definitely rooted in the British Progressive Rock movement of the late 70's, Rascal Reporter music. The group complied, issuing a 45rpm single in 1981, and a Landmark LP in 1984, "Ridin' On A Bummer," which boasted guests Fred Frith, and Tim Hodgkinson; their first reuniting since the break-up of their group, Henry Cow, in 1978. The Reporters' popularity increased greatly after this release. The Rascal Reporters' legacy was permanently cemented in 1988, when they released their "masterwork," "Happy Accidents" LP. The musicians they loved and were influenced by, were suddenly becoming their friends. As such, the LP. boasted guests, Guy Segers of Belgium's "Univers Zero", Nick Didkovsky of New York's "Doctor Nerve," Dave Newhouse of "The Muffins" (a very frequent contributor to their work; almost a "third member" of the group), Steven Feigenbaum, CEO of the Cuneiform Records label and Wayside mail-order company, playing his final-ever musical performance (guitar) on an album, David Kerman, of "5uu's," "U-Totem," and guest drummer on far too many CD's to list here, James Grigsby, leading composer for the group "U-Totem," as well as Steve Kretzmer's virtuoso bass guitar-playing older brother, Paul Kretzmer, who has been an RR "3rd" member on and off for 20 years. "Happy Accidents" sold out quickly and audience demand for more became greater. Up to this point, all music was released on the group-owned label, "Hebbardesque." Neither of the two Steve's are able to ``read or write" music in the formal sense. All music is composed by ear, and the "rote-repetition" discipline. It is certainly a bizarre coincidence that both musicians play keyboards and drums (Steve Gore being a stronger drummer; Steve Kretzmer being a stronger keyboard player), and compose music. Another very odd method of the group is this: The majority of the music is both completely composed and performed by only one of the two members at any one time. Basically, two "one-man bands" working together, forming a unique "Four-man band" comprised of two individual musicians with differing, but complimentary composing styles. Inviting guests to record with them is difficult. The music is so complicated, that the guest must be able to "reach music that the RR's don't know how to "write" out. The best-case scenario involves guest musicians who can both read music, and also play by "ear". This now propelled the RR's to the recognition level of a "Henry Cow" or a "Hatfield and the North." It is estimated that there are over 1,200 completed RR songs on tape in the "RRkives," thus allowing the band to retire, and rely strictly on archive releases, something the group would never do, as they are dedicated to the concept of continual musical evolution. The unique aspect of The Rascal Reporters is they are able to compose in virtually all musical genres: Progressive, Pop, Christian Pop, Jazz, Cabaret, Techno/Dance, Rock, etc. They are as simple as you want them to be, or as complex as you would like them. For the record, The Rascal Reporters' major musical influences are: The Beatles, Frank Zappa Gentle Giant, Egg, Hatfield and the North (and off-shoots), Henry Cow, Soft Machine, The Residents, Gryphon, The Enid Stackridge Univers Zero, Art Zoyd Tipographica, The Muffins, Burt Bacharach, Bela Bartok, The Archies, PFM, Van Dyke Parks, Brian Wilson Judy Collins, U-Totem, Bread, The Regeneration, Herman Szobel, Krzysztof Komeda, Genesis, Magma, etc.